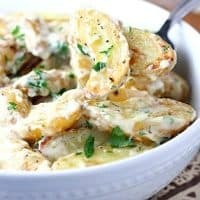 CREAMY HERB ROASTED FINGERLING POTATOES — Roasted fingerling potatoes are tossed with a creamy garlic and herb sauce in this unique side dish. 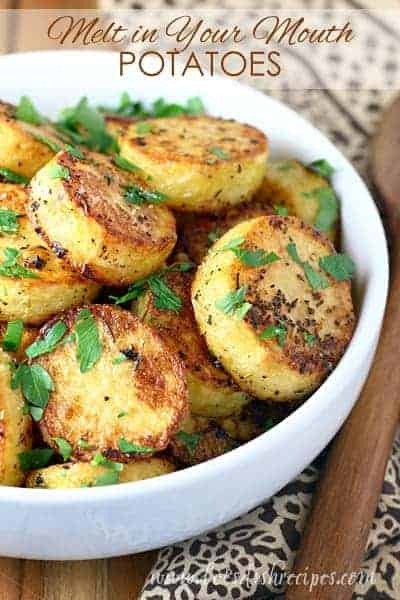 You really can’t go wrong when you serve potatoes as a side dish, and if you’re looking for a totally unique and amazingly delicious potato recipe, you’ve got to try these Creamy Herb Roasted Fingerling Potatoes. Just like the name suggests, fingerling potatoes are roasted until crispy, then tossed in a creamy garlic and herb sauce. 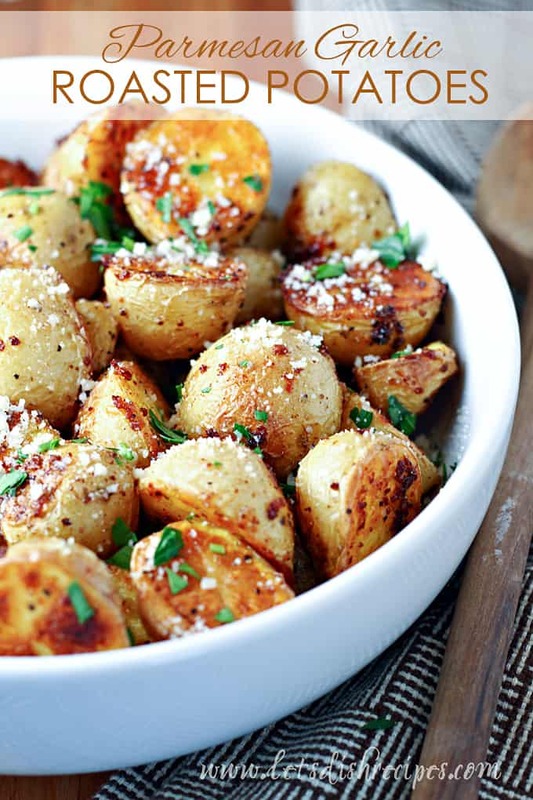 Which means these potatoes are crispy, creamy and full of flavor. My family really loved these potatoes! In fact, they couldn’t stop talking about how good they were–with their mouths full of potatoes. This would be a perfect side dish for almost any meal, but it’s especially great with beef or chicken. And it’s a little fancier than your typical potato side, which makes it perfect for company or holidays. They taste a lot like scalloped potatoes, but they are much, much easier to make. Mostly because you don’t have to spend time thinly slicing all those potatoes. I used fingerling potatoes in this recipe because I love the way they look and taste, but you could certainly use any kind of small potato. You could even use larger potatoes and dice them into bite size chunks. I’ve also been thinking about how good these would be with a little grated Parmesan cheese thrown into the sauce. I’ll definitely be trying that soon! 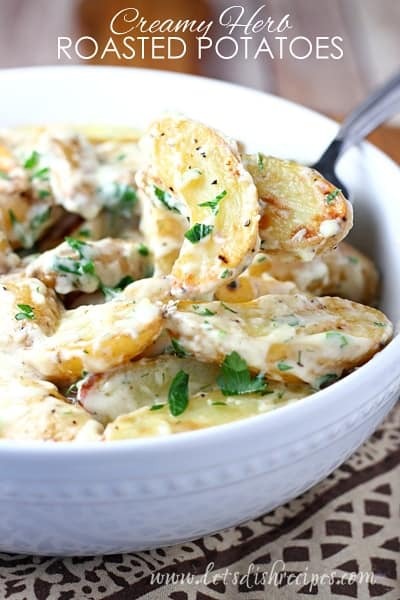 One thing is for certain, everyone will love these creamy roasted potatoes with garlic and fresh herbs. My family devoured them and they’re already asking when I’ll be making them again. Be sure to save this recipe for Creamy Herb Roasted Fingerling Potatoes to your favorite Pinterest board for later. 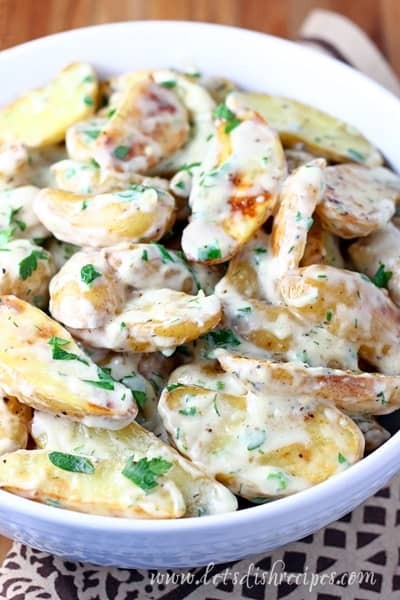 Roasted fingerling potatoes are tossed with a creamy garlic and herb sauce in this unique side dish. Preheat oven to 425 degrees. Arrange potatoes on a single layer on a large baking sheet. 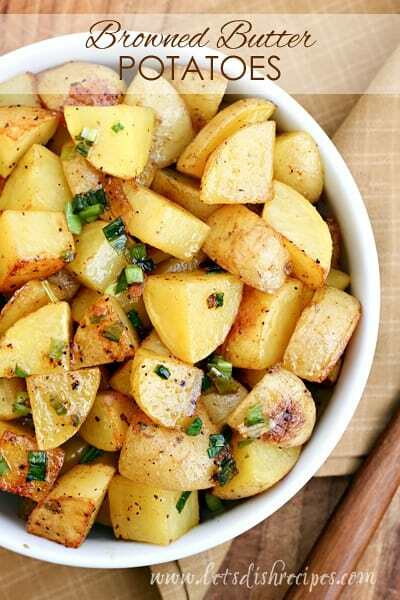 Drizzle olive oil over potatoes and sprinkle with salt and pepper. Toss to coat well. Bake for 20-30 minutes, or until potatoes are golden brown and tender. Meanwhile, melt butter in a medium saucepan over medium heat. Add garlic and cook until fragrant, 1-2 minutes. Whisk in flour and cook a few minutes more. Whisk in chicken broth and cream. Bring to a simmer, whisking constantly, until mixture thickens. Keep warm while potatoes finish cooking. Remove potatoes from oven and add them to a large bowl. Pour sauce over potatoes and toss to coat well. Add fresh chopped herbs and toss to combine. Taste and reseason with salt and pepper, if needed. Can we sub these with sweet potatoes ? Made these tonight with salmon recipe of yours. Family absolutely loved this dish. Thanks for sharing.